It was a day of false expectations. Until now, my memories of Asia have been remarkably accurate, and I remembered nothing good about this place. In fact, I’d scrawled WORST TOWN IN MYANMAR beside its name in my guidebook, and certainly wasn’t looking forward to coming back here. What Moreno and I found, though, was a charming backwater town with wonderfully friendly locals and hardly a foreign face to be seen. I can’t imagine now why I’d ever disliked it. Secondly, I hadn’t anticipated finding either of the two subjects I photographed here. At the beginning of the trip I’d listed the ten people I expected to be the most difficult to find, and these were the last two on the list. However, Moreno and I found them both quickly and easily. Along with the beggar girl in Yangon, the bicycle man in Jakarta and the coma survivor in Lombok, they make a very respectable total of five found from that list of ten. Finally, I expected the interviews to be short, lighthearted affairs, as our interviews with children generally are. But these are two children that have never had the luxury of a childhood, and our encounter was one of the saddest and most sobering experiences of our journey thus far. I hadn’t been certain of either subject’s gender, or whether there was any connection between them. As it turns out, they’re both girls – sisters, in fact. Neither girl was sure of her own age. Many poor people here give birth at home, and the date is often forgotten. The girl who appears to be the youngest is in fact the eldest by approximately four years. 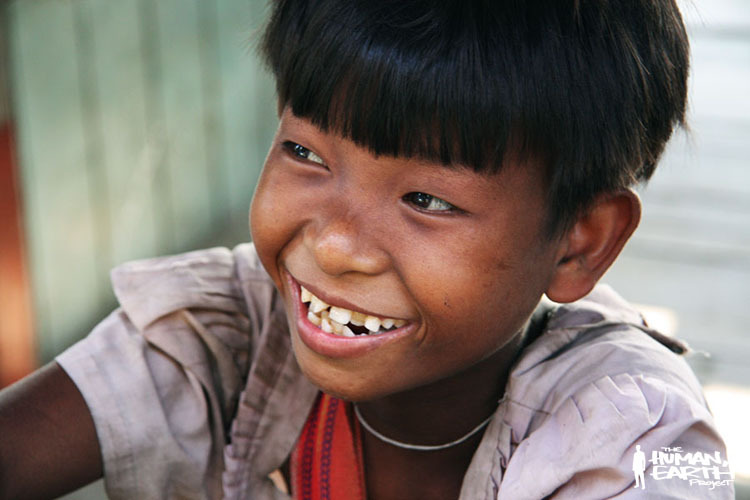 Her name is Phyu Chaw, and she has an impish grin full of jagged teeth. She tried to convince us she’s 25 years old, though her neighbours agree she’s really only about sixteen. Her younger sister, Ei Ei Nyein, is about twelve, and the more sombre of the two. The girls are the third and fourth in a family of five children. The father is no good, the locals say. They tell us he drinks every day, and has hardly worked a day in his life. It was the girls’ mother who supported the family, loading river boats with cargo for 1,500 or 2,000 kyat (US$1.55 or $2.06) per day. She’d also do what she could to get money from foreigners at the jetty – where I photographed her daughters almost five years ago, while waiting for a ferry – but now there’s a bridge across the river, the regular ferries no longer run, and the mother died almost two years ago of stomach illness. The eldest brother and sister are both already married. 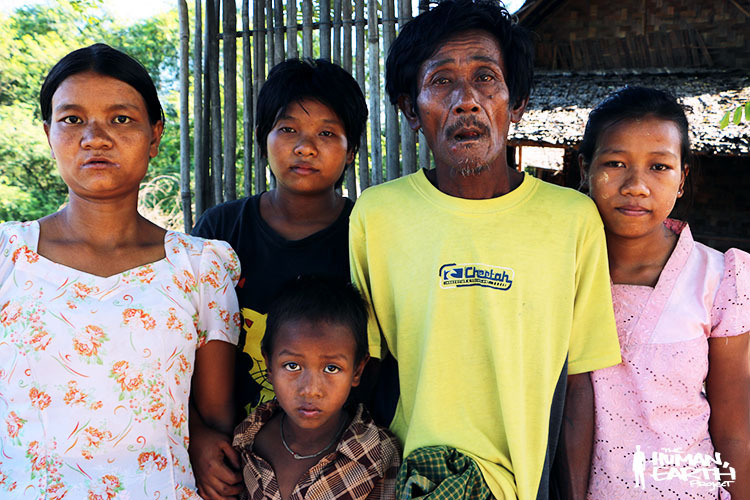 The eldest brother is no better than the father, the locals say, and can’t be relied upon to help support the family. With the death of their mother, Phyu Chaw and Ei Ei Nyein faced a simple choice: work or starve. 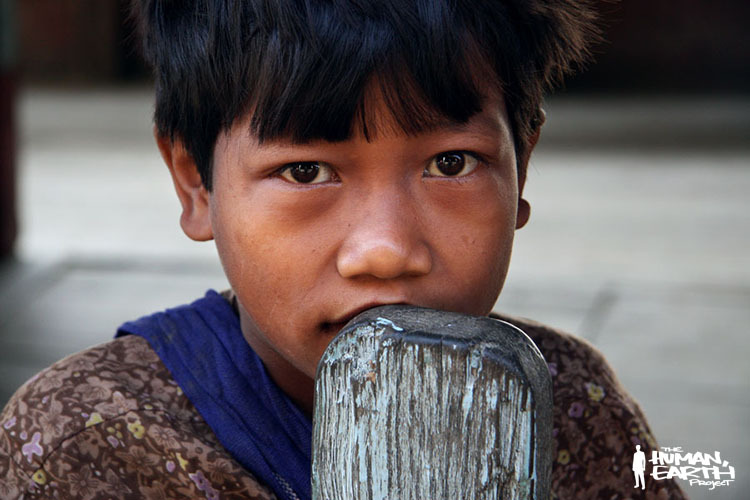 Children in Myanmar generally complete a minimum of five years of schooling; the two girls had completed only four or five years between them, and their work options were severely restricted. When I was twelve, I spent my time studying and playing with my friends, and rarely thought about where my next meal was coming from. Ei Ei Nyein has never had a chance to think about anything else. She begins work at six each morning, washing dishes and waiting tables at a local restaurant selling rice and noodle dishes. In return, she receives her meals, a place to sleep on the hard earthern floor of the tea house, and 20,000 kyat (US$20.62) per month. The only time she ever spends money on herself is when she needs to replace an item of clothing; otherwise, the money goes directly to her father. Phyu Chaw works in almost identical circumstances, with identical accommodation and rate of pay, for a local tea house twenty metres further down the same street. It takes each of these girls a year to earn the same money that you or I could earn in a week, if not a single day. The girls’ younger brother, Saw Lin, is now five, old enough to attend school. Instead, he spends his days with his father in the family home, a flimsy bamboo structure comprising less than ten square metres with no enclosed rooms, no furniture to speak of, and no items of any real value. Theirs is a poverty unimaginable in the West, yet here in Asia, they’re still a long way from the bottom. At least the girls have employment, however mind-numbing and poorly paid it might be, and a place to call home, however modest. What do they want from the future? I asked. What do they hope for? The girls didn’t know what to say; our local interpreter explained their silence. These girls have no hope, no future, he said. They have nothing, and never will, so long as their father lives. They think only as far as their next bowl of rice. But what do they want in life? I asked. Do they want to marry? To have children? This time, the response came quickly, and it was the saddest thing I’d ever heard from the mouth of a twelve-year-old child. It was a response that spoke not only of poverty, but also neglect. They don’t want to have any children. They don’t want another generation to suffer the way they suffer. I’m almost in tears as I write this. I sit here with a laptop, a camera and an mp3 player on the table before me. By Western standards, my possessions are few, and these are the only objects of any significant monetary value I own. Metres away, without so much as a window between us, I see young children playing in the dust of the street, and I wonder what the future holds for them. I can’t help but think of how much unrecognised power each of us has in the West – even the poorest amongst us – and what incredible potential we waste each day on trivial things. Each day we decide how to spend our money, our time, our love. We decide who to accept and who to reject, who to embrace and who to cast out. How different our lives might have been, to have been born from the womb of another mother, in another part of the world.